WHAT: Yet another extremely fun indie toy line to appear on the scene recently, Weirdos in Space adds a little twist to your typical "little rubber guys" by putting them in their own mini spacecrafts, complete with clear plastic domes. The initial set consists of two different creatures--Blurble's Gusto (pictured above) and Rampage Toys' Cupcake Lucha--each piloting their own Bio-Drone ship created by Tru:Tek, which you might recognize from the Tiny Terrors from the Deep mini figure set. The initial release of the figures featured a variety of color combinations, including all flesh, blue/orange as shown, and a few others which you can see in this post. I photographed the Gusto piece above on the lid of an old grill, believe in or not. I prefer to think of it as alien terrain. 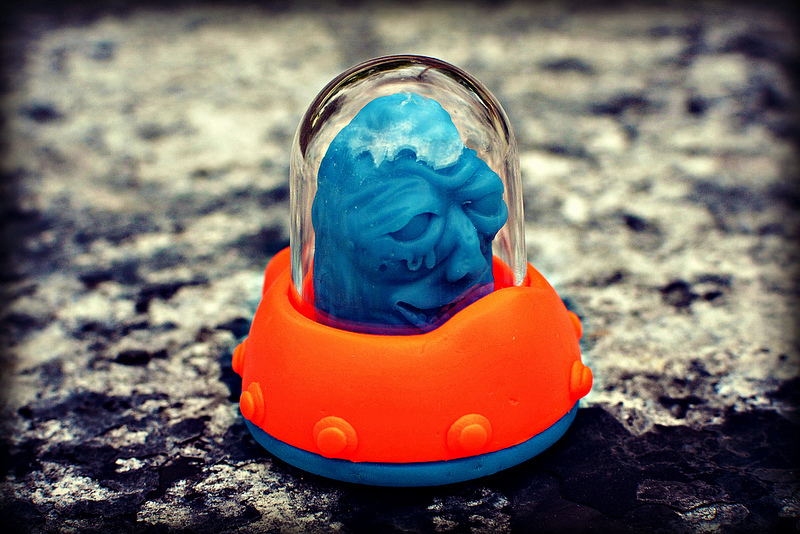 WHEN: Wave One of Weirdos In Space was made available in late spring of 2013. The initial batch sold out soon after being released, and I'm unsure whether there are plans to release more of these or new Weirdos In Space sculpts in the future. WHERE: The Weirdos In Space were available to purchase through Tru:Tek's Man-E-Toys.com store. The initial release sold out, but at the time of writing this you can purchase the Tiny Terrors From the Deep figure that uses the same Bio-Drone ship sculpt through the store. WHO: Tru:Tek produced and released the figures, collaborating with Rampage Toys and Blurble on the pilot characters.